Articles containing keyword "Attention deficit disorder with hyperactivity"
Pedreira Massa JL, González de Dios J. Diagnostic evidences in attention deficit disorder with hyperactivity in childhood and adolescence. Rev Pediatr Aten Primaria. 2017;19:e147-e152. 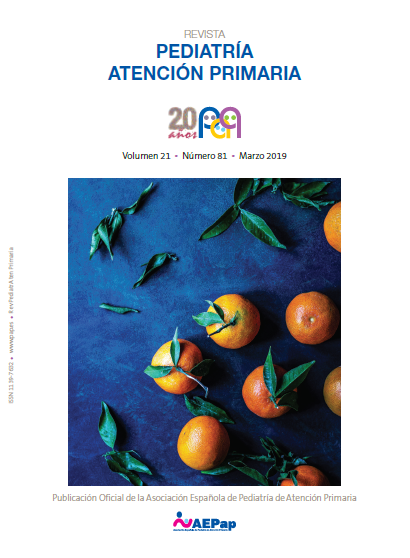 Almendral Doncel R, Peinado Postigo F. Prevalence and type of electroencephalographic alterations in attention deficit hyperactivity disorder. Rev Pediatr Aten Primaria. 2014;16:e133-e138. Is it necessary to perform an electrocardiogram in all children with attention deficit disorder before starting treatment with psychostimulants? Aparicio Rodrigo M, González de Dios J, Ramos Lizana J. Is it necessary to perform an electrocardiogram in all children with attention deficit disorder before starting treatment with psychostimulants? Rev Pediatr Aten Primaria. 2011;13:629-40. Rodríguez Molinero L, López Villalobos JA, Garrido Redondo M, Sacristán Martín AM, Martínez Rivera T, Ruiz Sanz F. Psychometric and clinical prevalence and comorbidity study of attention deficit hyperactivity disorder in Castilla y Leon (Spain). Rev Pediatr Aten Primaria. 2009;11:251-70. López Villalobos JA, Andrés de Llano JM, Alberola López S. Attention deficit hyperactivity disorder: psychoeducational orientations for parents. Rev Pediatr Aten Primaria. 2008;10:513-31. García Palomeque JC, Alloza JL. The use of pharmacogenetics in differential diagnosis. A case report. Rev Pediatr Aten Primaria. 2007;9:47-50. Buñuel Álvarez JC. Diagnosis of Attention-Deficit/Hyperactivity Disorder. Rev Pediatr Aten Primaria. 2006;8 Supl 4:S25-3. Lora Espinosa A. The treatment of the child and adolescent with ADHD in Primary Care from the point of view of the evidence. Rev Pediatr Aten Primaria. 2006;8 Supl 4:S69-114. Artigas Pallarés J. Algunas sugerencias at the paediatrician’s office. Some suggestions. Rev Pediatr Aten Primaria. 2006;8 Supl 4:S115-33. López Villalobos JA, Rodríguez Molinero L, Sacristán Martín AM, Garrido Redondo M, Martínez Rivera T. The Clinical Psychologist and the Attention-Deficit/Hyperactivity Disorder: links with the paediatrician. Rev Pediatr Aten Primaria. 2006;8 Supl 4:S157-73. Rubió Badía I, Mena Pujol B, Murillo Abril B. The paediatrician and the family of a child with ADHD. Rev Pediatr Aten Primaria. 2006; 8 Supl 4:S199-216. Attention Deficit Disorder with Hyperactivity: go ahead! Fernández Pérez M, López Benito MM. Attention Deficit Disorder with Hyperactivity: go ahead! Rev Pediatr Aten Primaria. 2004;6:421-432.